Are These We Buy Houses Companies Legit? You’ve seen the ads – usually bright yellow, written in sharpie “We buy houses, get cash for your home now!” Or maybe you’ve gotten a letter in the mail, or seen ads online. It sounds too good to be true – that you could sell you home, in any condition, for cash and close fast. The truth is, the majority of these companies are legitimately wanting to buy your house. There is a buyer for every house, as long as the price is right and fits with the condition of the house. If you need to sell a home, maybe an inherited home or a rental property you no longer want, that is in disrepair, needs major updating or is even full of junk, you would have a hard time finding a retail buyer. An investment company, however, will be happy to buy this home and fix it up for a profit. The benefit for you is not having to clean and repair the home, not having to pay real estate commissions and getting the home sold fast. Make sure to check into the company or local buyer wanting to purchase your home. Find them online, check the BBB and find a few references if you can. You’re main concerns should be if they are a reputable company and if they for sure have the money in hand to buy your home. STL Real Estate has been buying homes in St Louis for several years now. We’ve helped hundreds of people sell their homes and have renovated this properties so that a new family could become home owners. We offer fair, transparent cash offers that benefit all parties involved. We want to work with our clients to make sure their real estate goals are met. A typical question we get asked is “Are these we buy houses companies for real?” Yes. There are a lot of really good companies in St. Louis and throughout the nation that help homeowners sell their houses. What I would suggest is to make sure you get the information you feel is necessary to ensure these companies are legitimate. One of the things I recommend is to check the BBB. Not all companies will be registered with the BBB but it’s a good starting source. You will also want to check their website. Luckily, most companies have websites though, not all of them but most of them do. Certainly, bigger companies have websites. Article Written By: Ryan Wessels, a local real estate buyer and co-owner of STL Real Estate. 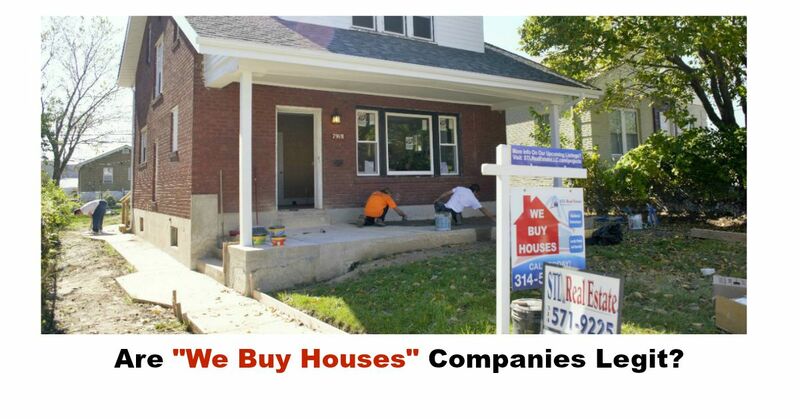 STL Real Estate is also a “we buy houses” company that could purchase your house with cash under the right conditions as well. If you need to sell your home fast in St. Louis, we can help!